April 22 - Joshua 24:15 - But if serving the Lord seems undesirable to you, then choose for yourselves this day whom you will serve, whether the gods your ancestors served beyond the Euphrates, or the gods of the Amorites, in whose land you are living. But as for me and my household, we will serve the Lord. April 23 - Psalm 55:22 - Cast your cares on the Lord and he will sustain you; he will never let the righteous be shaken. April 24 - Hebrews 4:12 - For the word of God is alive and active. Sharper than any double-edged sword, it penetrates even to dividing soul and spirit, joints and marrow; it judges the thoughts and attitudes of the heart. Just 6 more days (two more lessons) in the 30 day challenge and the Typography class. So far, this has come together very nicely! 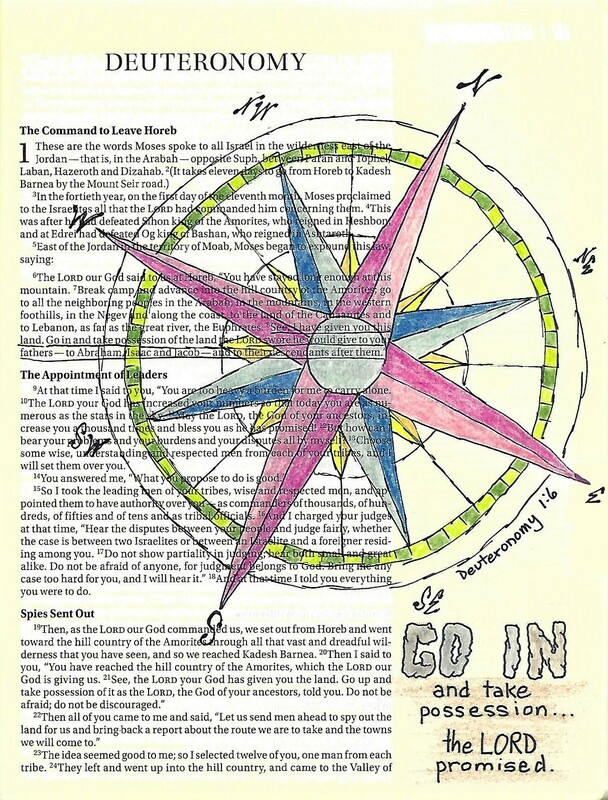 Three more days of bible lettering for the 30-days challenge. The technique being explored in Typography For Bible Lettering is'kerning' - the process of letter spacing for readability and impact. April 19 - 1 Chronicles 16:24 - Declare his glory among the nations, his marvelous deeds among all peoples. April 20 - 1 Corinthians 16:14 - Do everything in love. April 21 - Proverbs 18:10 - The name of the Lord is a fortified tower; the righteous run to it and are safe. This has been such a fun challenge. 9 more lessons to go. Now, for the Typography class, the projects wre to feature 'word stacking'. My prompts continue to be from the 30 Days of Bible Lettering challenge. April 16 - 1 John 4:18 - There is no fear in love. But perfect love drives out fear, because fear has to do with punishment. The one who fears is not made perfect in love. April 17 - Psalm 139:24 - See if there is any offensive way in me, and lead me in the way everlasting. You can see from the text I have highlighted for each date, they do not sometimes match what the art says. That is because I highlighted in red the text I thought I would use foe each day. But then, as I progressed on the art, sometimes I changed my mind. I did not go back to change my original worksheet though. Hope you're not tired of this series yet because we have a l-o-o-o-g way to go yet. I promise it will be worthwhile, though. We had so much fun with serifs on the basic round print several weeks ago that I wanted to repeat those options on the basic block print. Since we are covering three books this week, we have three words on which we can get a taste of each of the three serif styles. Start by writing out the words (and numbers) in the basic block print. To the first line add triangle serifs. To the second line add basic serifs, which come in the form of blocks. When we drew the letters with lines, the serifs were lines. Now with the letters as blocks the serifs are blocks as well. On the third line of text we turn the edge of the block serifs to the ‘flying bird’ form and, voila, you get ‘western’ letters. Trace the letters along with the outline of the serifs using ink and then erase the pencil. You can decide at this stage if you want to leave the letters open or ink then in or fill them with color. I like to leave my sample alphabets open as I can then clearly see the structure of the letters. When I am using them in a project, I can finish them off in any way I choose. We discussed on day one this week the guideline for these blocky serifs – if the letter is lines then the plain serif is a line; if the letter is blocks then the serif is blocks. One thing that was not pointed out is that the blocky serifs should be the same width as the elements of the letters. You will note that this sample sheet does NOT follow that rule. I tried to create the serifs digitally in paint software and I have much less control when drawing with the mouse! This is the style of writing you will often see on athletic wear (sports jerseys). 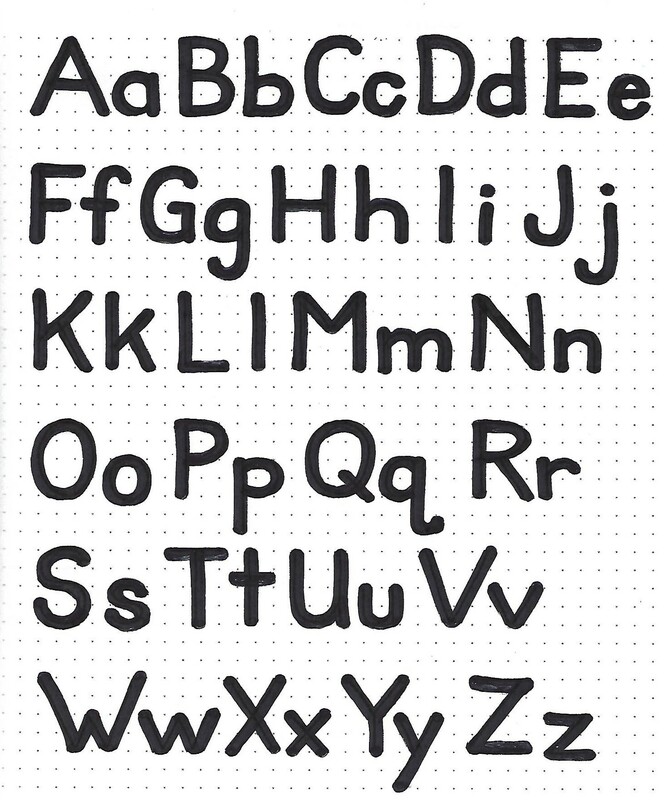 Begin by writing out the basic block alphabet in pencil. Then pencil in the block serifs (doing a much neater job than me). 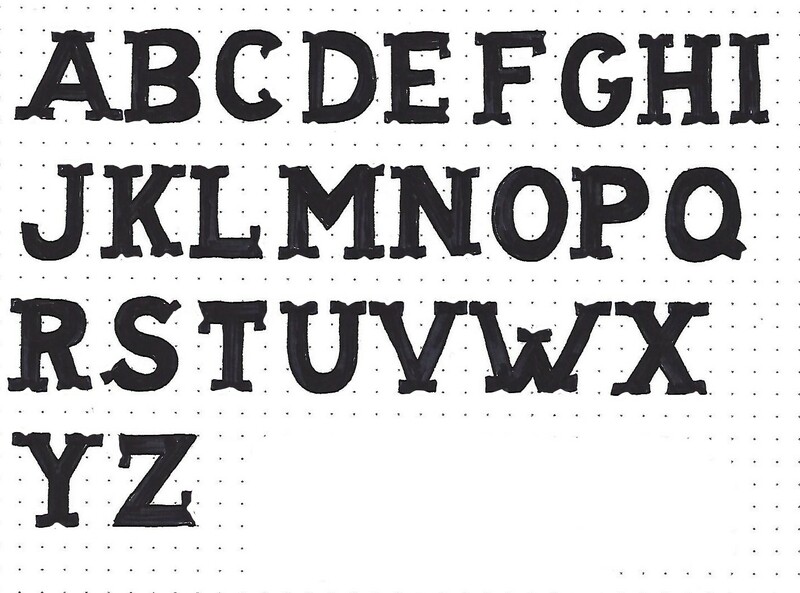 Ink the outline of the letter, encompassing the serif, and then erase the pencil. Again, you can choose to fill your letters like these or leave them open. Many sports letters are outlined in one color and filled with another (representing the team). The western serif is an easy transition from the blocky serif, simply indent the block serifs with the flying bird shape. When you have completed all your wing shapes, outline the letters in ink and erase the pencil. Then fill with ink or color. 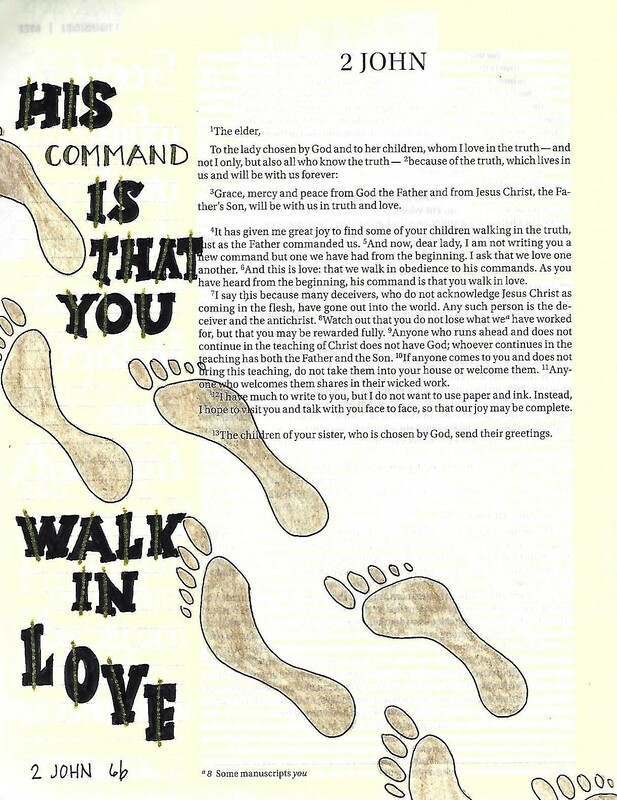 Every week we complete the lesson plan by using the new lettering style in our Bible. We have three choices this week from the various versions of serifs on block lettering. 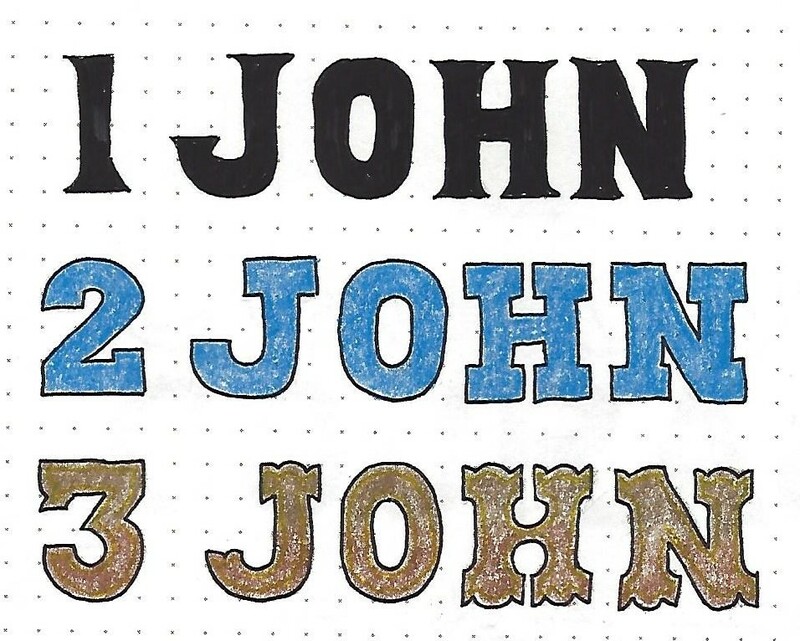 Use any of these options to write out a scripture from 1st, 2nd or 3rd John. On your page, sketch out the letters lightly in pencil, correct until they are exactly as you want them, trace over the pencil with pen and then, when the ink is dry, erase the pencil. I made my block print more casual and added the basic block serifs. After inking them in solid ink, I used a gold glitter gel pen to draw a single vertical line through each letter. This adds a further element of creativity and demonstrates how you can make this lettering your own. We are, this week, tackling week 7 of building on lettering styles. This week we will learn three ways to adapt the basic block lettering to create other creative styles for our Bible journaling. The sample word below is a taste of day three – making stencil letters. Start with all of the word written out in pencil using the basic block letters we learned last week. 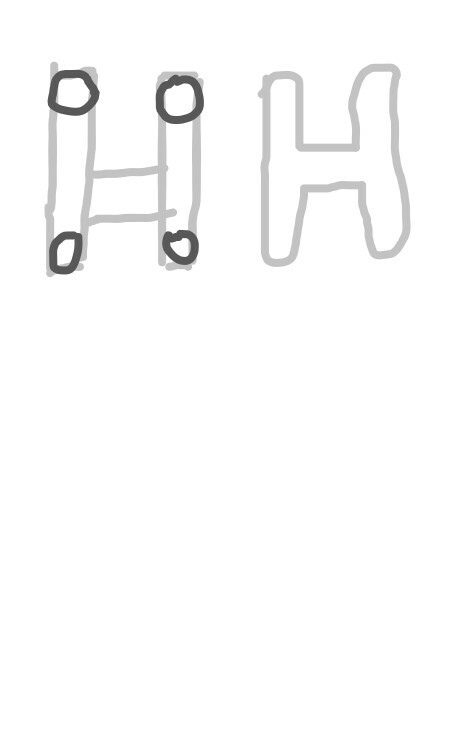 Then draw in a little break where the letter parts change direction. Ink in the letter and erase your pencil outlines. You may choose to leave the letters open as they show here or fill them in solidly with ink or color. The first full alphabet we will cover this week is the rounded block. Use pencil to write out basic block letters in both upper- and lower-case letters. I have done the sample with narrower elements that the alphabet we learned on last week. Work still for a consistent line width. The next step is to draw a circle at the end of every line ending. Keep the circle contained inside the line so it does not make the letter taller than the original pencil marks. Then trace around the letter, in ink, using the rounded ends instead of the squared off ones. Erase pencil and fill in solid. 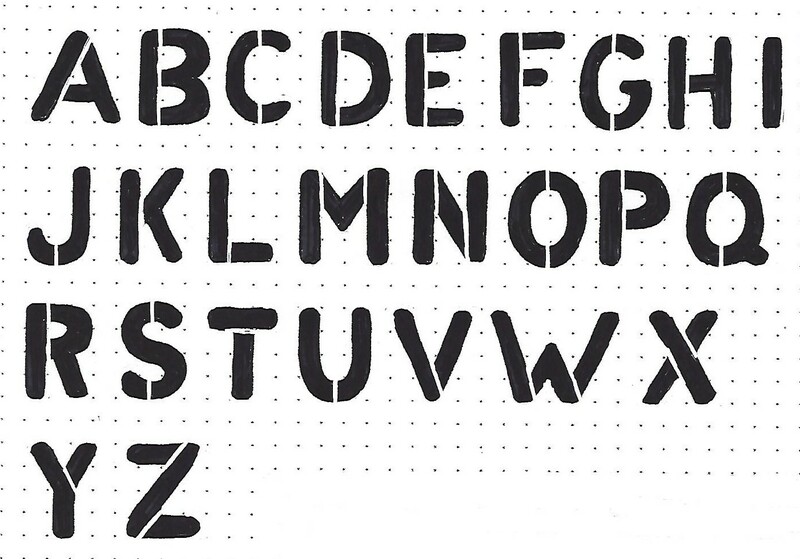 The stencil alphabet goes back to being an all-caps lettering style. We got a taste of this on day one. Start with all of the alphabet written out in pencil using the basic block letters we learned in week 6. 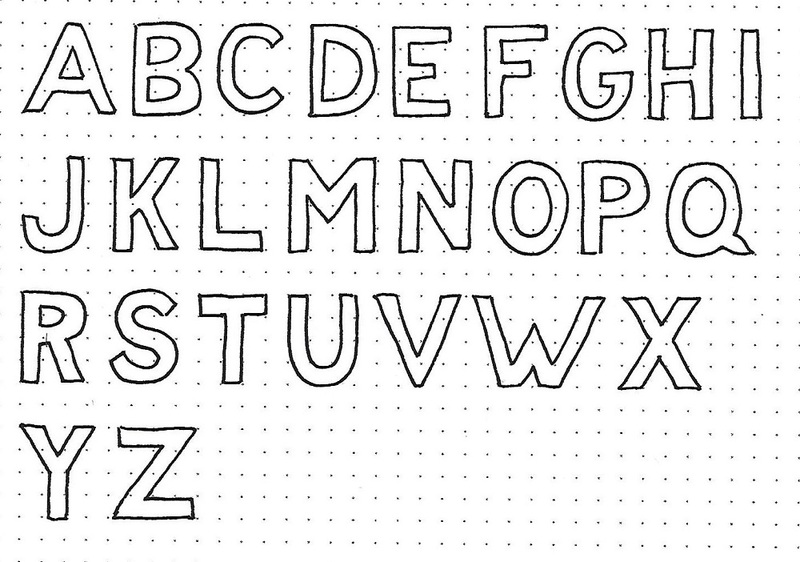 Then draw in a little break where the letter parts change direction. Note that the H only has one break in my sample. You can choose to add a second break on the right side. Also note that the Q does not break at the tail, even though it is a direction change. 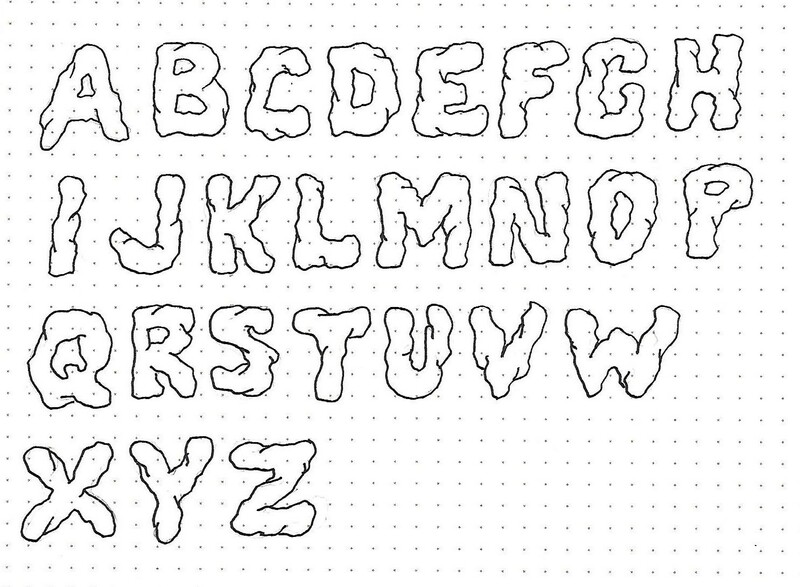 Ink the outline of the letters and erase your pencil outlines. You may choose to leave the letters open or fill them in solidly with ink or color as shown. This is similar to a novelty style that was taught here in July 2018. 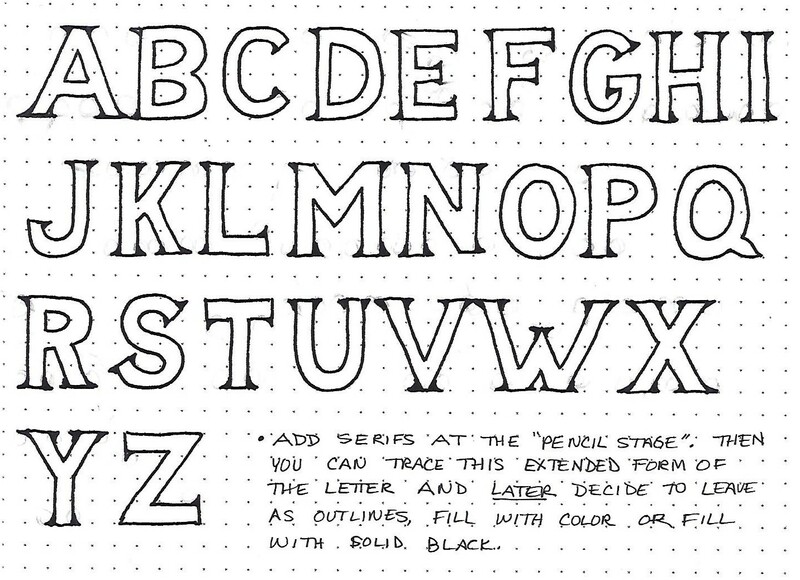 Begin by drawing out your basic block lettering alphabet in pencil. Convert your smooth outlines to lumpy, bumpy ones and draw in a few ‘cracks’ extending inward from a few of the dips. It is okay if your letters look a bit misshapen. Trace the outlines and cracks in ink and erase your pencil marks. The ‘Solid Rock’ version of the block letters was used sparingly on this page in Deuteronomy. Your assignment is to use one of the enhanced block styles learned this week on a scripture in your Bible in Deuteronomy. Continuing on with my series on progressive lettering development, I have a set of lessons based in the book of Numbers in the Bible. We are moving now into an entirely new letter form – the basic block. We will only be working with an upper-case. Note that all of the letter parts are the same width, whether they are verticals, horizontals or angled and whether they are straight or curved. On the sample I made these elements one unit wide which works well with a letter height of four units. The letter widths will vary as you can see with the M below. Be sure you are working in pencil throughout the design and layout stages and only ink your letters after they are exactly the way you want them. Just as we did with the basic round letters, we will be exploring a variety of ways to customize this basic style over the next few weeks. So, work now to develop good form so you have a good base from which to branch out. This is the full alphabet for the basic block letters (capitals only). Just as with yesterday’s sample this is a four-unit letter height with one-unit elements. Strive for consistency in your letter forms. The hardest letter to achieve is the S with its double curves, though that seems to be a common problem with most alphabets. This is one of the reasons it is important to start with pencil and only ink after everything looks like you want. You do still have some leeway in the basic forms. I think I may have gotten the W a bit too wide and I note that the Q is the only letter that has a non-blunted end. Try correcting these in your own alphabet, or offer them as options on your page so you can choose between forms if you like when using the alphabet for a project.